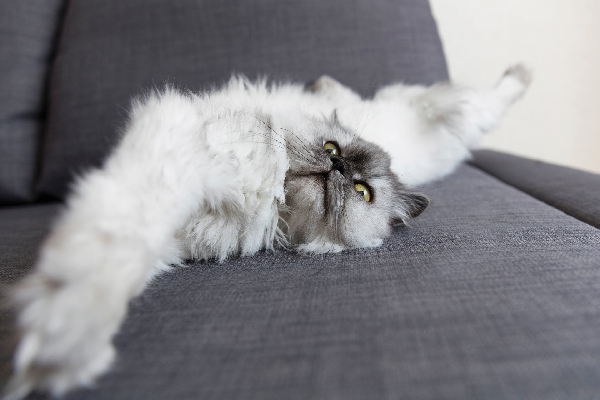 Let’s Talk: What IS It with Cats and Cabinets?! I call my Cosmo "Captain Cabinet" because he loves hanging out behind closed cabinet doors. And then he gets mad if I disturb him! Cats like secret places. They like to hide away where humans can’t see them (or so they think) and enjoy some alone time. I often find my cats behind the sofa, under the bed, and tucked away inside the cave in their cat tree. I totally get it — sometimes I like to sneak away like that, not answer the phone and let the solitude swallow me right up. I wish I could fit inside that cat-tree cave. It really is a sweet hiding spot. Cosmo has always been one to dash into open cabinets. He’s my little nosy explorer and wants to know what’s behind every door. And once he’s inside, he wanders around a bit (if the space is big enough), and then just sits. That’s it — he just sits and looks around. Even if I close the door, he doesn’t start meowing or pound on the door, wanting to escape. Nope. He just sits. 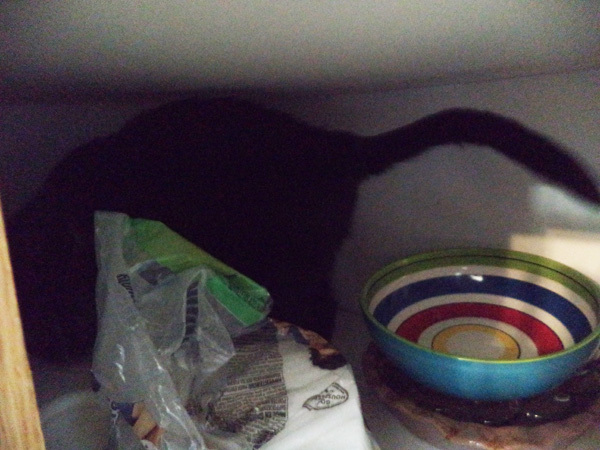 There have been a few times he’s wandered in an open cabinet and I close it without knowing he was inside of it. Later, I opened it to see him sitting. And staring. He always catches me off guard and makes me laugh. Most of the time, he still seems to have no desire to leave his post, so I continue to check on him until he’s decided his hideaway time has come to an end. Occasionally, he looks surprised when I open the door — like I’m invading his private space. Like I shouldn’t be grabbing a box of aluminum foil until he’s vacated the space. I’ll let you know when you can have the foil. OK, Captain Cabinet. I can see why he likes to chill in cabinets that contain comfy contents like towels and linens. It’s kind of a perfect getaway for a cat: dark, private and a built-in bed. I remember once reaching in for a towel and finding him lying atop the stack. I hated to move him, but I needed a towel. This resulted in a Jenga-like game wherein I attempted to pull a towel from underneath him without causing too much of a disturbance. 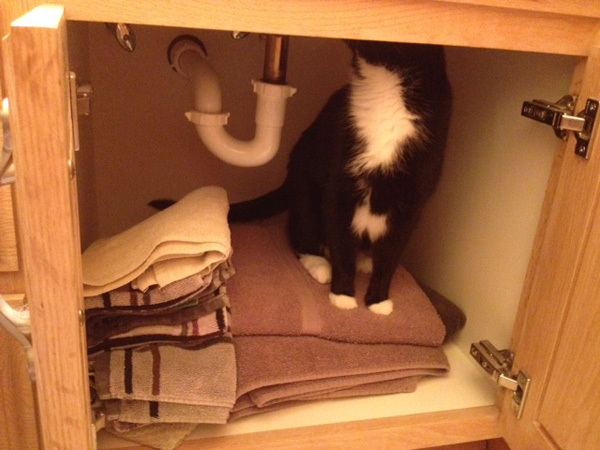 It didn’t work — he quickly left the cabinet, evicted from his cushy cave. I think if he could have flipped me off he would have. I suppose the look on his face conveyed the same message. It’s funny, the other two cats have no desire to hang out in cabinets. They might sniff around a little bit, but they don’t want to enter. Phoebe did accidentally get stuck in the big cabinet we use as a food pantry. She immediately started pawing at the door and whining, like she was going to die if I didn’t immediately release her. 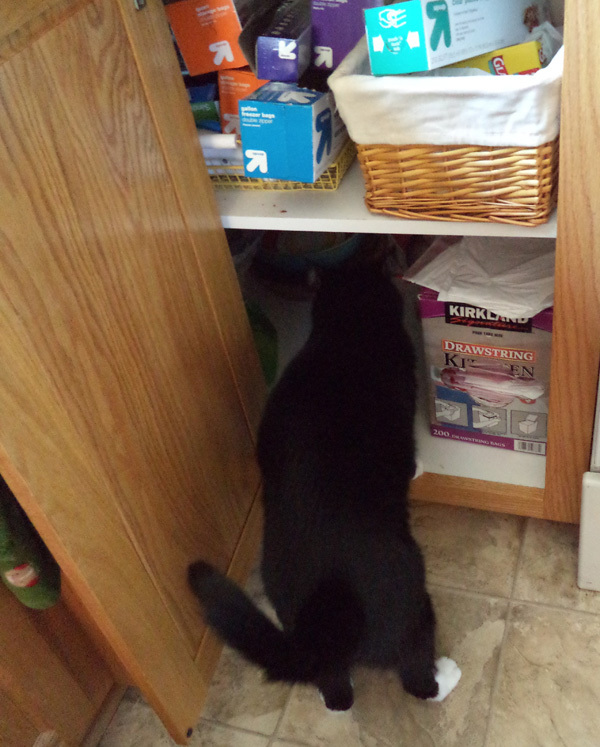 I’m sure Cosmo was around the corner, wishing it had been him who’d wandered inside the food cabinet. His eyes would burn with jealousy. It’s not always easy being Captain Cabinet — sometimes you win, sometimes you lose. 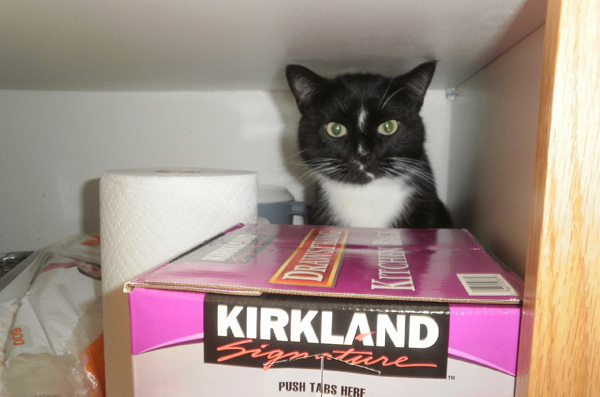 Does your cat like hanging out in cabinets or closets? Tell us about it in the comments!